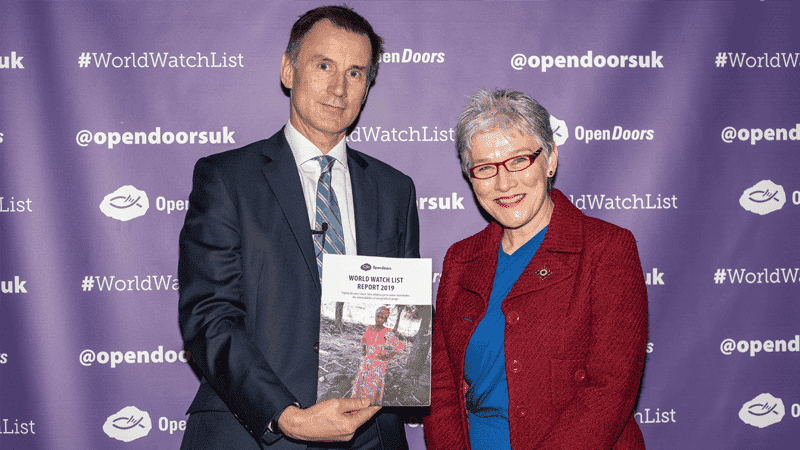 Foreign Secretary Jeremy Hunt and Open Doors CEO Henrietta Blyth at the World Watch List's parliamentary launch. A new report by Open Doors has revealed the extent of Christian persecution around the world. 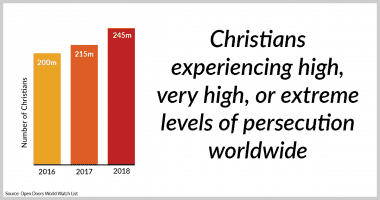 The 2019 report reveals the number of Christians experiencing high levels of persecution reached 245 million. Its annual World Watch List details the 50 countries where persecution is at its worst. Open Doors estimates over 4,300 Christians were killed because of their faith over the last year, though the true figure is thought to be much higher, with friends and relatives said to be afraid to report killings. Most of these deaths occurred in North and Central Nigeria, where 3,700 Christians were killed for their faith, including 1,885 in ‘genocidal’ acts in Plateau state. Levels of persecution in Nigeria are categorised as ‘very high’, but despite the violence, the country is only twelfth on the World Watch List. Persecution is thought to be ‘extreme’ in eleven countries, including India, which overtakes Syria to make the top ten for the first time. In Asia an estimated 140 million Christians – one in three – are persecuted. Persecution in China was said to be receding in 2017, but it is on the rise once again, with the country jumping from 43 in last year’s list to 27 in 2019. President Xi Jinping has considerably tightened control of religious affairs in the last year, with new rules dubbed “the most restrictive in 13 years”. CEO of Open Doors UK and Ireland Henrietta Blyth said: “Our research uncovers a shocking increase in the persecution of Christians globally. “In China our figures indicate persecution is the worst it’s been in more than a decade – alarmingly, some church leaders are saying it’s the worst since the Cultural Revolution ended in 1976. The report was presented to MPs at the World Watch List’s parliamentary launch yesterday. Foreign Secretary Jeremy Hunt said: “I think it is an extraordinary figure that almost a quarter of a billion people are suffering persecution today because of their Christian faith. He said it should always be high on the list of priorities for Foreign Office ministers to raise the issue of persecution in countries where it is happening.